Tattoos are considered to be a cool and edgy style statement and therefore, they enjoy a high status among the rappers. Most of the stars from this community have got tattoos on their bodies but some of them are so obsessed with the body art that they have got as many body parts tattooed as they can and their love is still going great guns. The tryst does not seem to have materialized fully and they look set on getting more of the style statements for themselves. Soulja Boy is one such rapper. He has got more than sixty tattoos on his body. One of the most tattooed celebrity, Soulja Boy tattoos are known to reflect his self ego. He has got his own name tattooed on his stomach. His own label SODMG also features on his face, just above the eyebrow. Soulja also seems to have a religious inclination as he has got a cross on his back and below his eye. His tattoos denote the multiple aspects of his personality and he is running out of space to get more of them. Here we have created a post with 25 Soulja Boy tattoos that will give you different glimpses into his tattoos. Take a look. If you liked our selection, perhaps these other posts will interest you too, Travis Barker Tattoos, David Henrie Tattoos, Lebron James Tattoos and Carmelo Anthony Tattoos. Holding his hands together in a praying position, Soulja Boy makes a cool show of his multiple tattoos. Soulja Boy looks at his palm exposing his multiple tattoos resting on the forearm. Soulja Boy has got many tattoos on his neck that also includes a dollar, hawk and various other symbols. A shirtless Soulja shows off his body art in style to the audience. The rapper has got his name carved in italics on his stomach i.e. just Soulja. The popular rapper with numerous tattoos on his body gives a cool pose wearing a T-shirt and a locket bearing his name. Soulja boy has boundless love for tattoos and that shows on his hand too covered with a lettering. Soulja Bot tattoo portrait in which the lion and hawk are the most noticeable living creatures. Soulja boy has got letters on the ends of his fingers and shows them in style with a victory sign. Arms, fingers, neck, chest, stomach, face; Soulja has got all of them tattooed. A small cross rests below the eye of Soulja Boy indicating his religious inclination. The rapper has his whole torso inked with many tattoos that also has his name in it. The music lover has a big musical notation on his neck that also suits him pretty well. Moon, stars and a cross on his back make for lovely tattoo symbols that also have spiritual value. The rapper’s love for money is well-known and he expresses it through a dollar symbol etched on neck. 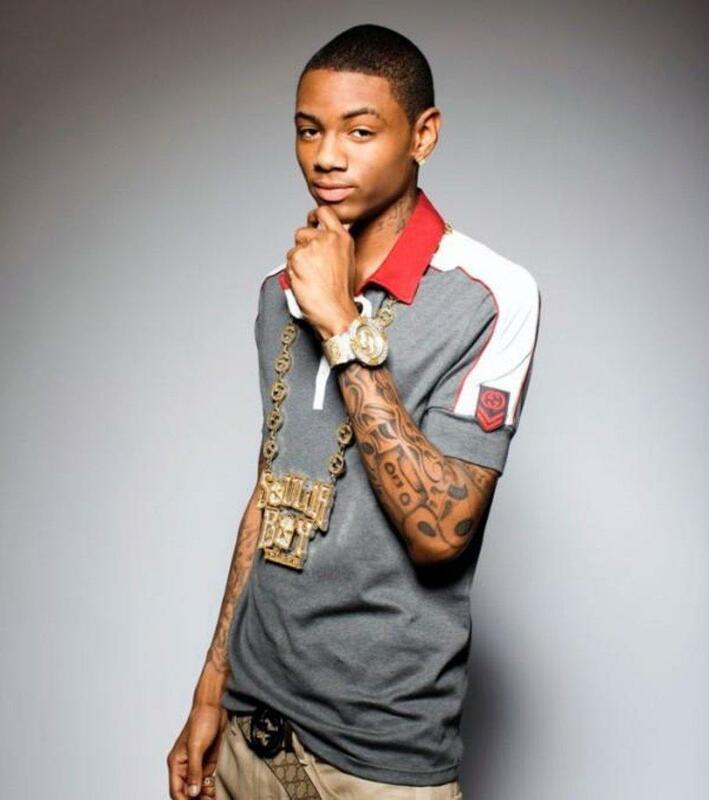 Wearing bracelets and a heavy locket bearing his name on his tattooed arms and chest, Soulja looks fantastic. The chest of Soulja Boy has a liner that says “hustle sleep get money”. A head shot of the rapper with a black and white display showing off his chest and neck tattoos. The forehand of Soulja Boy has a pattern that resembles a tribal design and looks funky. 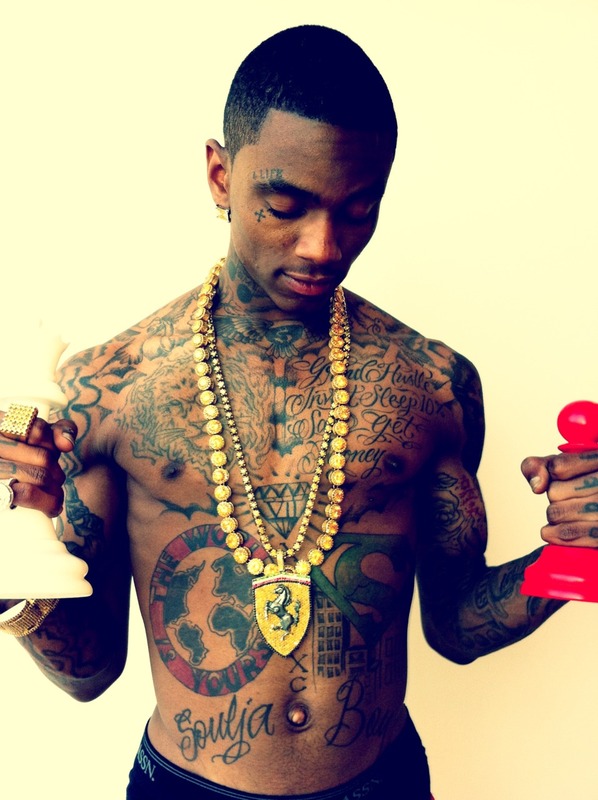 The arms of Soulja Boy are inked in black with patterns and they definitely lend him a cool rock star look. The face of the rapper has got a Chinese symbol, a cross and his own label SODMG as tattoo designs. You can see some dash of color on his belly in the red and green circles made as part of tattoos. The tattoo fanatic inside Soulja seems to be hell-bent on getting his whole body tattooed and he has succeeded partly in his attempt. Soulja Boy with Arab, another tattooed rapper who seems to share his love and obsession for the cool style statement. Soulja Boy with a cute female fan poses in style showing off his fingers tattoo.